On April 15, 1948, President Manuel Roxas died of heart attack after delivering a speech in the Kelly Theater of Clark Air Force Base in Pampanga. The President who was on a long standing invitation from Major General E. L. Eubank, went to Pampanga on official visit accompanied by Senate President Avelino, Speaker Perez and General Jalandoni. Feeling fatigue after his speech to the officers of the Air Force base, the President went to rest at the residence of General Eubank where he suffered several heart attacks dying at 9:23pm. 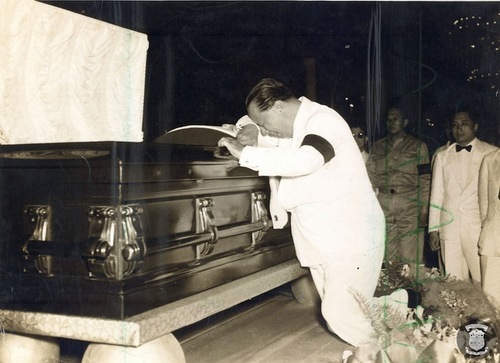 Vice President Elpidio Quirino knelt and wept unabashed before the casket bearing the remains of Manuel Roxas (Photo credit: Philippine Presidential Museum and Library tumbler account). His body was brought to Manila the following day on a special train reaching Malacañang at about 9:20am. Vice-President Elpidio Quirino, who was on a cruise in southern waters at the time of the President's death, arrived in Manila on April 17 and took his oath of office as President in the Council of State room in Malacañang. Quirino then appointed a committee to take charge of the funeral arrangements for the late President and issued a proclamation declaring a period of national mourning from April 17 to May 17. Sessions of Congress were suspended until after the burial which was set for Sunday, April 25. President Roxas was buried at the Cementerio del Norte. Earlier, on January 28, in the same year (1948), President Roxas with the concurrence of the Congress, granted general amnesty to alleged Japanese "collaborators" charged with treason during the 3 year Japanese occupation.